Lowercase labels are clear, allowing the original capital letters to show along with the lower case label letters. They are available in white or black print on clear labels. 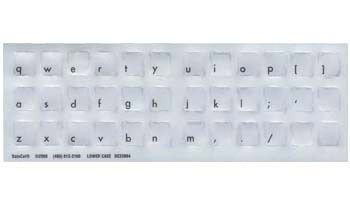 Lowercase English keyboard labels are available in white letters on clear labels. The letters are printed on the lower left corner of the keyboard label so as not to interfere with the original key legend or character on the key. The label set includes the labels necessary to create the US keyboard layout according to the Microsoft code page.